As I’ve worked with business and organizational leaders I’ve discovered that there are probably 4 types of business owners and leaders. First, there are the TECHNICIANS. These are the men and women who do all or most of the work themselves. That’s all they know to do. They think owning the business is just about doing the “technical” work. If they own a plumbing business, they do all the plumbing. If they own a CPA Firm, they do most, if not all, of the accounting. If they own an HVAC services company, they are the primary A/C technician, taking calls and doing the work. Michael Gerber in his book The E-Myth Revisited argues that MOST small businesses are started by technicians. I’ve come to believe that he is right. However, I’ve also discovered 3 other types that start businesses. The second kind is CREATIVES. These are the men and women who sell new ideas or creative works. Their creative works may be in design fields, or they may be in the areas of technology, music, media, motivation, or ideas. My experience has been that these creatives start some of the highest money-making businesses I’ve seen IF they don’t get caught in the trap of micro-management (i.e. technician work.) While technicians are not typically creatives, almost all the creatives I’ve worked with are artist types who have “technician” tendencies. I call them “1 and 10” leaders. 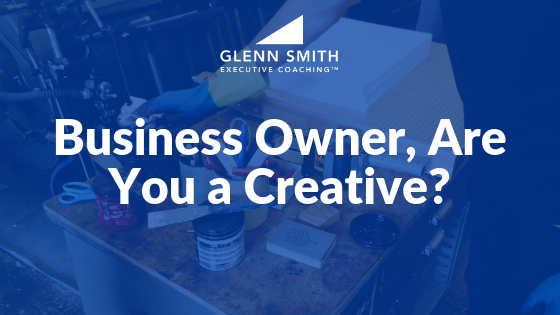 The most successful and dynamic leaders I’ve known tend to be creatives. The third and fourth types are MANAGERS and LEADERS. Leaders tend to work on a more strategic level while managers tend to work on a more process and systems level. Leaders inspire and set direction. Managers manage people, processes, and systems. With that said, most small business owners tend to be technicians who need to learn how to be managers and leaders. See my post “The 3 Levels of Work.” I’ve found this is very doable! However, every once in a while I meet the “creative” type. They are typically the most challenging for me as a business coach to work with but always have the greatest earning potential. One of the more recent creatives I’ve worked with started a business with a “new idea.” In just 8 short years he sold it for a 9-digit figure! Honestly, I don’t think people can be taught to be creatives. I think they are born that way! 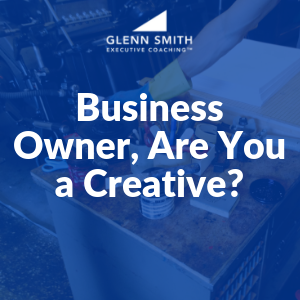 If you are a “Creative” who owns a business, contact me. I can help you realize your full potential! As I’ve worked with business and organizational leaders I’ve discovered that there are probably 4 types of business owners and leaders. Creatives start some of the highest money making businesses around! Glenn Smith is the CEO of Glenn Smith Executive Coaching in Houston, TX. He has been blogging since 2005 and is a local expert in marketing, business systems, and professional development. He helps executives and business owners achieve exceptional performance in their business and their lives. Sign me up for Marketing and Business Tips!